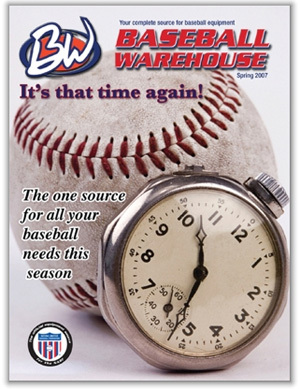 Baseball Warehouse is an online retailer and one stop shop for all of your baseball needs. Baseball Warehouse offers baseball bats, wood baseball bats, baseball gloves, baseball bags, batting helmets, catcher’s gear, custom colors, pitching machines, baseball training aids, baseball clothes, baseball accessories, protective equipment, sunglasses and even umpire gear. 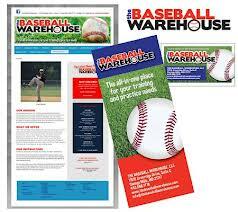 Baseball Warehouse accepts Visa, Mastercard, Discover, American Express and Paypal. While it doesn’t take a lot of tech savvy to order from their site, Baseball Warehouse also has customer service representatives that can take your order over the phone Monday through Friday between 10 AM and 7 PM Eastern Time. For those who don’t want their orders tracked through the phone or the internet for some reason, Baseball Warehouse features a printable order form that can be mailed in. Through this method you can also pay by check or money order. Baseball Warehouse does not accept cash. Baseball Warehouse offers a 30 day “no sweat” guarantee which buyers can return any product that doesn’t meet their satisfaction for a “full” refund and return shipping. There is a 20 percent restocking fee for returned items but it is waived if you take the refund in store credit. You don’t have to use store credit immediately. Baseball Warehouse offers free ground shipping on orders over $99 and all orders received by 3 PM EST standing time are shipped within one business day. Orders can be tracked through the website’s online fulfillment center. 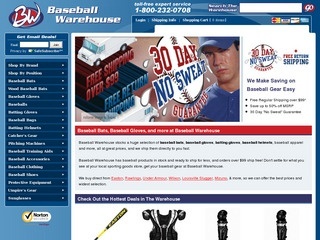 Among the competitors to Baseball Warehouse would be other online baseball specialty sites such as Baseball Express, Baseball Savings and Better Baseball. Using Google or any other search engine to search “baseball equipment” should expose you to new online baseball specialty sites which may have sprung up since this article was written. You could also opt to buy your equipment directly from the manufacturer’s website. Another alternative to Baseball Warehouse would be to make use of the baseball section of your local sporting good store. Amazon also has a very large selection of baseball equipment and apparel and would be considered a competitor of Baseball Warehouse.